An industrial dispute in western Kazakhstan that is dragging on into its sixth month is casting a shadow over the Central Asian state’s all-important energy sector. Fresh forecasts suggest that the strike is having a significant, negative impact on oil production, and could undermine Kazakhstan’s efforts to join the ranks of the world’s top 10 oil producers. 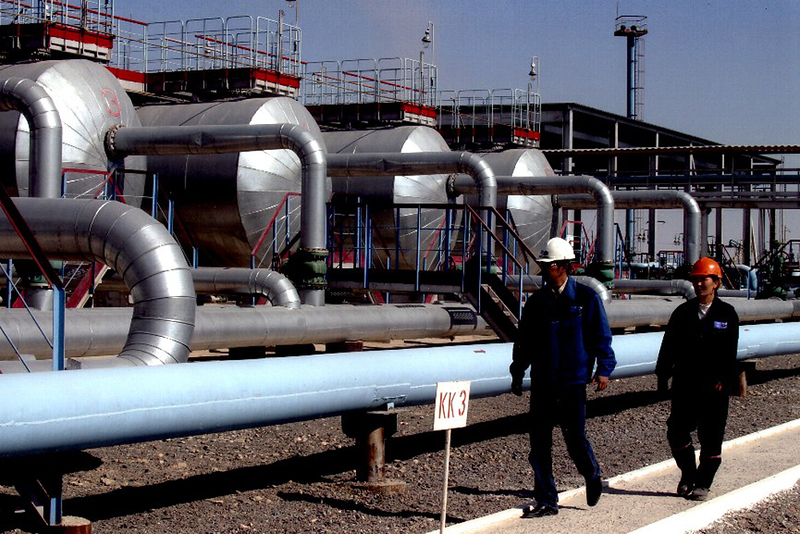 KMG EP, the London Stock Exchange-listed exploration and production arm of the state energy firm KazMunayGaz (KMG), reported recently that it produced 9.2 million metric tons of crude oil during the first three quarters of 2011, 7 percent less than during the same period last year. For the entire year, underproduction is forecast to reach 1.15 million tons, an amount that is 8.4 percent below target. The strike began in May over a wage dispute. During the summer, it took a nasty turn when managers at two KMG EP-affiliated energy companies began summarily firing almost 2,000 workers for participating in the industrial action. With the disgruntled employees removed, KazMunayGaz then moved to declare the strike over. But the complaints have not gone away, and a black cloud of controversy continues to envelop oil production in western Kazakhstan. The strike has caused “colossal damage” to state coffers, said Timur Kulibayev, the head of the Samruk-Kazyna fund that oversees Kazakhstan’s state companies. Kulibayev – who is President Nursultan Nazarbayev’s son-in-law – told a round table on September 29 that strike-related losses to the state would approach 54 billion tenge ($365 million) this year. He also said KMG EP faced an annual loss of 40 billion tenge ($270 million). In addition to shorting government coffers, the strike has caused PR damage, most notably when rock star Sting cited the labor dispute as his reason for cancelling a concert-for-hire in Astana. Amid growing concern over the economic impact of the labor action, Nazarbayev’s administration in Astana is showing signs of wanting to broker a genuine compromise. Thus far, KMG EP has been uncompromising over the key demand of higher take-home pay. The company insists that its employees are fairly compensated, noting that it has raised salaries six times since 2008 and that it offered strikers the chance to return to work. Verifying KMG EP’s wage assertion is tricky due to a complex salary-calculation system that makes gauging take-home pay difficult. KMG EP says staff easily earned $1,500-$3,000 per month; workers dismissed from KMG EP’s Ozenmunaygaz (OMG) unit who spoke to EurasiaNet.org cited figures in the $1,000 range; and some Kazakh media reports have quoted employees as saying they earned less than the national average wage, $630. Salaries in western regions are the highest nationally, but the cost of living is above average, and living and working conditions are tough. The workers fired by KMG EP have not faded away. A large group has set up a tent city in the center of Zhanaozen, a dusty town three hours’ drive from the regional administrative center of Aktau. From there, they have kept up their protest, demanding reinstatement and a review of salaries. They are also calling for the release of lawyer Natalya Sokolova, who was advising the strikers before her arrest. She was imprisoned in August for six years for “inciting social enmity” in a case that sparked international criticism and which was raised at the OSCE’s annual human rights conference in September. Kulibayev said alternative jobs on a railroad project had been proposed, but turned down. That offer was confirmed to EurasiaNet.org by Nurlibek Nurgaliyev, a dismissed lathe operator. “We refused because we are demanding our own work,” Nurgaliyev explained. Astana is eyeing the broader backdrop to the strikes, particularly Zhanaozen’s socioeconomic problems. Its population more than doubled from 2000 to 2010, reaching 125,000, due to the oil boom and an influx of migrants. There are not enough jobs for all, and as Zhanaozen’s population swells, oil reserves are declining. Remaining reserves are estimated at 150 million tons, according to Zhanaozen Mayor Orak Sarbopeyev – enough to last three more decades. A strategy is in place to diversify the town’s economy – but inhabitants will rely on the energy sector for employment for the foreseeable future. The dichotomy between the expectations of protestors occupying Zhanaozen’s central square – who consider themselves still to be company staff – and the stance of KMG EP – which considers them ex-employees – is perhaps the largest stumbling block to finding a compromise. So is Astana ready to get actively involved in the effort to resolve the impasse? Observers can’t be sure.